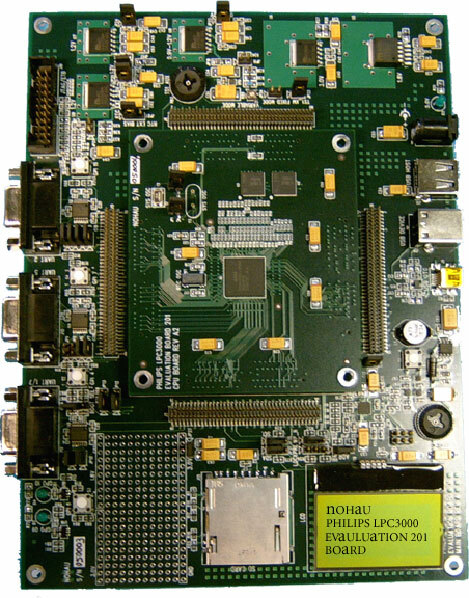 If you have lost or did not recvieve the LPC3000 Evaluation Board Supplemental CD with your board, you can send an E-Mail request to support@icetech.com requesting information on how to download it. Download the Evaluation boards user guide here ! A Single power supply input (5.0V), regulated on board to provide all the necessary EVB voltages. 32M (8M x 32) Bytes of SDRAM. 32M (32M x 8) Bytes of NAND FLASH. 1 - LCD Module with Philips PCF8558 built in. 1 - SD Card connector. 3 - USB connectors (USB A Receptacle Connector for USB Host; USB B Receptacle Connector for USB Device; USB Mini AB Receptacle Connector for USB OTG) with Philips ISP1301. 3 - UART (RS232) physical interface circuits connected to standard PC style DB9 female connectors. 4 - 80 pin break-out headers, to provide easy access to many of the microcontroller pins. 4 - User input pushbutton switches. 2 - User output LEDs. Small prototyping area consisting of an area of 0.1 inch spaced through holes with easy access to ground and 3.0V, 1.8V power supply points. Nohau® , Seehau, EMUL51-PC, EMUL68-PC,EMUL-ST10/SUPER10/C166S V2-PC, EMUL12-PC, EMUL-and EMUL-ARM-PC are trademarks of Ice Technology a dba of Enable Engineering Co., Inc.. Other products and brand names are trademarks or registered trademarks of their respective holders.